Earlier this month, I bottled the mash I made 10 years ago, adding a little cider vinegar to each bottle. I ordered some labels from Vistaprint.com Yesterday, the labels arrived and I stuck them on the bottles. I put this info on Facebook to commemorate the hot sauce. Bob Hurt added 2 new photos. Decade long habanero hot sauce project… Reserve your bottle now! 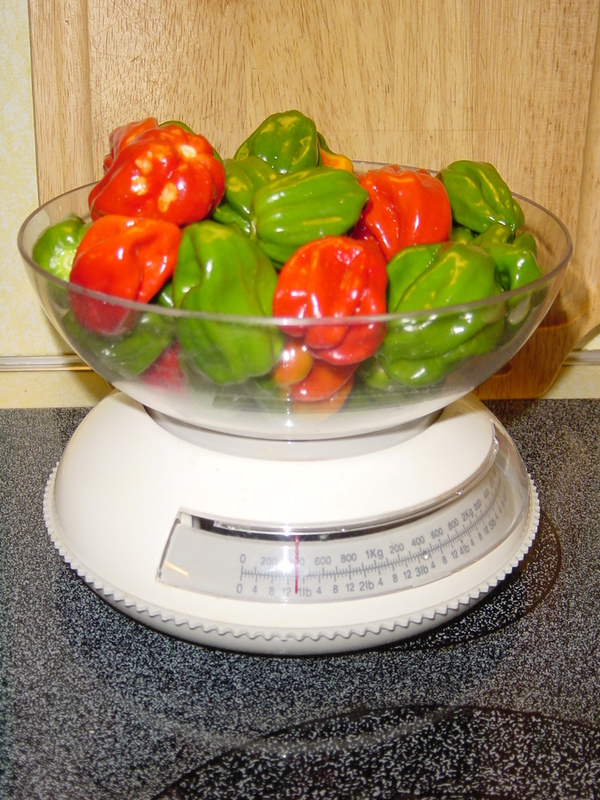 In 2003 I grew several bushes of Red Savina habanero peppers. In 2004 I harvested the peppers, removed seeds by hand, pureed them with 6% salt, put them glass jars, fermented then for a month at room temperature, then stored them in my refrigerator. Now in 2014 I have removed one half-gallon jar from the refrigerator and sealed the mash uncooked into one dozen 5-ounce bottles. Each bottle contains one ounce of apple cider vinegar and 4 ounces of aged, fermented, Red Savina pepper mash. This is the world’s premier gourmet hot pepper sauce, aged for ten full years. I calculate its value at about $250 per bottle. Each bottle provides flavor indescribably mysterious, exotic, and mellow, plus searing heat that rushes into your soul, warming you from stem to stern. I have started working on a web site to merchandize this magnificent collaboration of mam and nature. I’m working on label and packaging. I can accept advance orders. This product is not available in stores. Supply is extremely limited – only one dozen bottles is available worldwide. Act now to reserve yours. Yes I do hold another jar in private reserve. 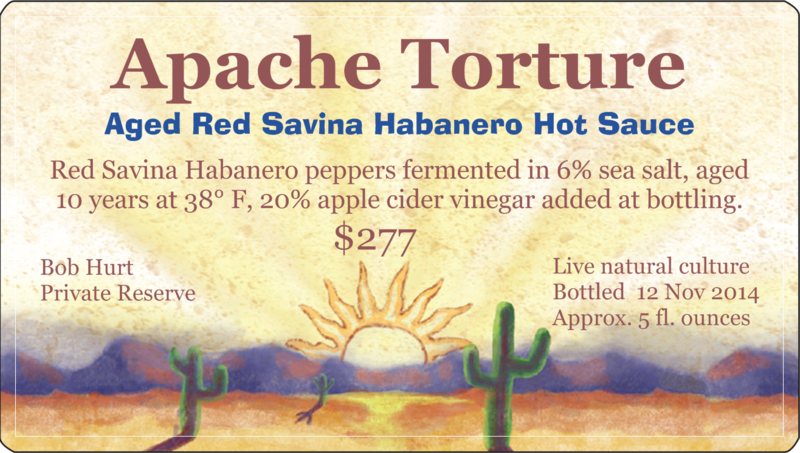 I call this sauce “Apache Scorcher.” I originally planned to put this label on it, but I thought Apache Torture might torturously offend some Apache. I also removed the appropriately valued price. I have only 10 bottles of this extremely rare, tasty but tortuously scorching-hot sauce available. Write to me via http://bobhurt.com/contact.php if you want to order one. I accept Paypal donations. Remember, I have only a LIMITED SUPPLY of this delicious sauce. NOT FOR SALE ANYWHERE ELSE ON THE INTERNET or at pepper festivals anywhere. Donate NOW to reserve your bottle while supply lasts.